The American Shakespeare Center’s 2014/2015 tour Method in Madness is coming to the University of Alabama on Sunday, March 1st to perform Shakespeare’s Hamlet. Details are here. Some of our graduate students recently attended Method in Madness shows in Birmingham, and I want to share their impressions of the great work ASC is doing. Patrick Earl as Benedick and Stephanie Holladay Earl as Beatrice in MUCH ADO ABOUT NOTHING. Photo by Michael Bailey. The American Shakespeare Center’s touring production of Much Ado About Nothing hoists the audience out of Shakespeare’s Messina and drops us, bell-bottoms and all, at a disco somewhere between Love Boat and An Officer and a Gentleman. Here we witness the “merry war” between Beatrice and Benedick set to a soundtrack of brass and bravura. The accompanying spectacle is fully of heady effusiveness. In suitably irreverent style, the cast takes up the revelry of Shakespeare’s language and recontextualizes it with a little glitz and a lot of guts. What we end up with is a celebration of Shakespeare’s playfulness—the ASC’s Much Ado is a touch campy and a dash cartoonish, and the actors embody this conceit with aplomb. Stephanie Holladay Earl’s Beatrice is by turns acerbic and sassy. Without sacrificing any of the character’s assertiveness, she balances Beatrice’s defiance of early modern social norms with a tenacious sense of humor. Her performance, ultimately, is both engaging and charming. As Benedick, Patrick Earl tempers swagger with a boyishness that emerges into maturity as the play progresses. He plays the commitment-phobic soldier with hyperbolic bravado, and through the transition from lothario to lover, Earl’s Benedick remains eminently likeable. Doubling abounds in this cast, and the actors rise to the task with impressive versatility. Susie Parr effervesces as Hero, while Andrew Goldwasser and Stephen Brunson are riotous as Dogberry and Balthazar, respectively. This reimagining of Much Ado owes much of its success to its distinctly twenty-first century comic delivery. In a Messina of powder blue suits, Gilligan’s Island slapstick and KISS-themed masquerades, it’s the counterbalance of fond nostalgia and optimistic silliness that gives the ASC’s production its (considerable) charisma. 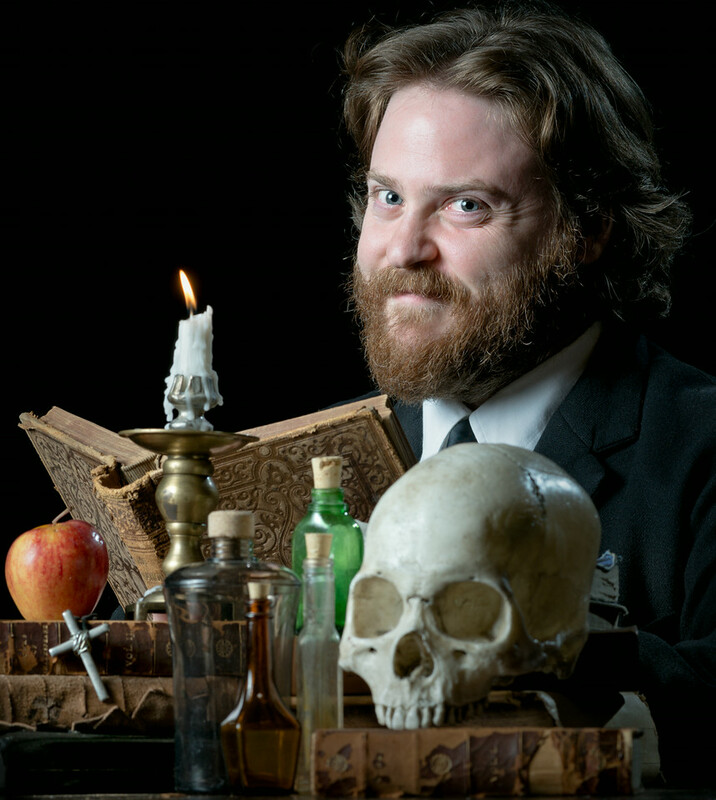 Andrew Goldwasser as Faustus in DOCTOR FAUSTUS. Photo by Michael Bailey. Though Christopher Marlowe’s Doctor Faustus is probably the most well-known Elizabethan play outside of Shakespeare, the drama is not often performed by modern theatre companies. Staging the battle for its protagonist’s eternal soul, the play asks significant questions about heaven and hell, fate and free will, knowledge and power. These questions were addressed cleverly, and in many cases effectively, by the American Shakespeare Center’s production of Doctor Faustus as part of their Method in Madness tour. The company tackled a difficult and ambitious text yet managed to produce a play was both entertaining and thought-provoking. By following the “basic principles of Renaissance theatrical production”, the ASC ensures that the strength of its offerings lies primarily in the performances of its actors—and the actors in Doctor Faustus did not disappoint. Andrew Goldwasser delivered a magnetic performance as the titular doctor who, seduced by the promises of necromancy, sells his soul to Lucifer for twenty-four years of all the knowledge and power he could desire. Stephanie Holladay Earl played his devilish companion Mephistopheles with the perfect balance of charm and control, wit and wickedness. By interacting with the crowd throughout the play, Earl, Goldwasser, and the other actors quickly pulled the audience into the production, making them complicit in Faustus’s “hellish fall.” A second strength of this particular production was the sophistication of its visual effects, despite the restrictions of the company’s limited touring equipment. These effects were especially apt in conveying the horrors of hell: the use of fire in the production was both dramatic and impressive, and the movement of faceless devils, twisting and contorting in brown body suits, was surprisingly eerie and effective. Comprised of nuanced performances and stunning visual effects, the ASC’s Doctor Faustus was a compelling production of Marlowe’s most enduring tragedy. You can find photos of ASC’s recent shows (and food truck experiences!) at their Tumblr. As always, if you have any questions about our upcoming events, feel free to contact Nic Helms via wordpress or at nrhelms at crimson.ua.edu. Before the show began, the woman next to me (a British schoolteacher) leaned over and said, “We came because we heard it was controversial.” Her husband smiled dutifully. Rupert Goold’s Merchant of Venice is set in a raucous Las Vegas, complete with card tables, bad suits, and gaudy lights. Launcelot Gobbo (Jamie Beamish) opens the show as an Elvis impersonator, complete with song and, uh-huh!, dance. Antonio (Scott Handy) and Bassanio (Richard Riddell) are what you’d expect: the one a glum businessman, the other a polished youth with just enough hair gel to suggest rakishness. It’s clear that Antonio loves Bassanio, and clear that Antonio is dismayed by Bassanio’s plans to gamble on a marriage with Portia (Susannah Fielding). Standard Merchant fare, plus Las Vegas. Portia and Nerissa (Emily Plumtree), however, are anything but typical. The game of the three caskets is transformed into a game show, Destiny, hidden in the basement of one of Las Vegas’s buildings. Contestants appear in trumped up, false personas: Morocco the boxer, Arragon the matador, Bassanio as Hercules himself. Portia and Nerissa are also layers of ornament: while their actual accents are Southern (and thickly ridiculous), they put on the airs of dumb blondes during the show, which is projected on TV screens above the stage. I his climactic choice of the lead casket, Bassanio rails against ornament: his choice shuts down the show, and Portia reveals self-consciously strips away her own ornaments: the accent, the platform shoes, the blonde wig, even the false confidence. She’s still daddy’s little girl, even after his death. I haven’t mentioned Patrick Stewart’s Shylock yet. Stewart reprises this role by emphasizing Shylock’s jewishness, blessing his daughter in Hebrew, contrasting his cool, businessman’s exterior with his reactionary religious intolerance, even wearing a kippah and a tallit during the courtroom scene, which is held in some dark, sanitized torture room of a prison. He is Patrick Stewart (with a full head of hair!) and both his intensity and his emotional control are astounding. Everyone gets what they want in this scene, and it destroys them. Shylock makes Antonio fear death and ultimately face it, becoming the monster Antonio so reviled and feared: Shylock’s only way to touch him; Antonio faces death for Bassanio’s sake, testifying to his love, but Portia trumps that testimony by saving him, saving her husband’s lover. And Portia sees what she came to see. The play does not end with jokes and happy reunions. It ends with the unadorned truth, the bare lead that Bassanio hazarded for. Everything is out: Antonio’s love, Gratiano’s pettiness, Jessica’s self-hatred, Portia’s self-fabrications. Life unadorned: it’s a controversial thing. Imagine that you’re a soldier in the sixteenth century. You’re at the edges of a battlefield, caked in the blood of your enemies. You make your way through a abandoned, desecrated church: the stained glass windows are smashed to bits, the statues are reduced to rubble, and the faces of the murals are fall scratched out. This is what the Protestants think of iconography. Above you, you see the bodies of three dead children, hanging from meat hooks. Their foreheads are marked with ashen crosses. You wonder, who killed these little angels? Who put them here? And then they open their eyes and speak your name. I tell this tale vilely. 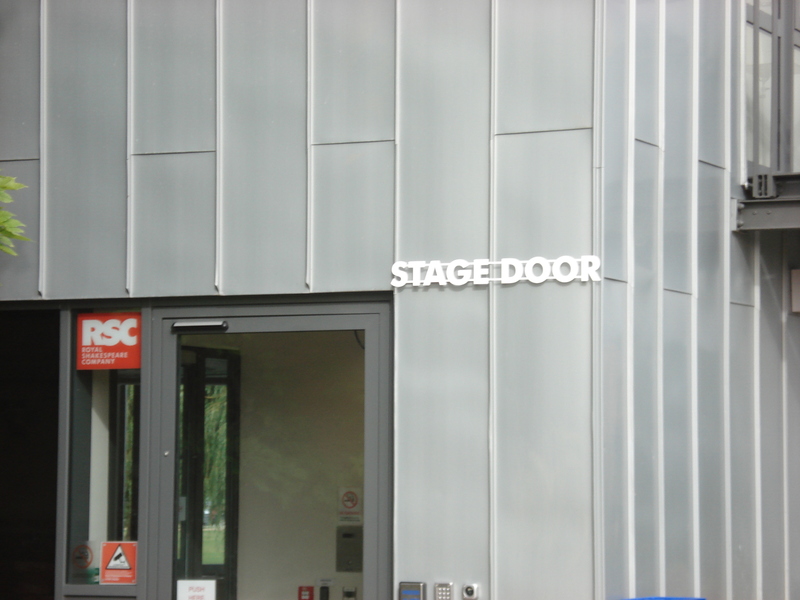 I should first tell you how a wounded man stands alone on the thrust stage of the newly refurbished Royal Shakespeare Theatre, and a priest calls out to him from among the audience: “Doubtful it stood. Doubtful it stood.”. The messenger takes up the words and begins the Soldier’s speech to King Duncan, who appears out of the mists. The soldier, we soon learn, is Malcolm, the King’s son. The priest is Ross. Boyd sets his production against the historical backdrop of iconoclasm, the 16th century Protest purge of Catholic and Anglican religious imagery: statues, murals, stained glass windows, and representation of God, Christ, or saints. The imagery seems clear: faces, false and true; the sacred torn down; the ghosts and ruins of the past. And even if one might miss the historical nuances here, the program includes several short articles to bring every spectator up to speed. The production itself employs standard Renaissance costuming: leather cloaks, riding boots, rapiers. We find ourselves more in Shakespeare’s England than in the Scotland of yore. At first glance, this play is standard fare: Macbeth (Jonathan Slinger) is ambitious, rash, and potent; Lady Macbeth (Aislin McGuckin) is strong-willed, seductive, and finally self-destructive; their performances are top-notch RSC fare, as with the rest of the cast. But the witches! Here the magic begins. Macbeth’s first encounter with the three weird children is short: no “toil and trouble,” no talk of familiars or magic, only ominous prophecies and the eerie laughter of children in the dark. Thus far, any type of witch might do: wise, undead children are a particularly frightening branch of the supernatural, but other dire figures might suffice. The Porter, too, seems standard fare: dressed in red, bearing fireworks, and merging with the minor character Seyton (pronounced Satan), this man is more Devil than Porter. A not uncommon choice. Macbeth kills Duncan, Macbeth becomes King (ordained with water and crowned by Ross), Macbeth orders Banquo’s murder. All is well. Then. Seyton is the third murderer. He stands back as the others kill Banquo. When the two murderers leave, Seyton gestures and Banquo rises, leaving with him. At the banquet, Macbeth imagines that Banquo’s corpse kills him, slitting his throat. I fear of actual harm from Macduff, Macbeth meets with the weird children again. Hecate and the spells are gone: the children merely step onstage holding dolls, which they use to deliver their prophecies. Macbeth is emboldened and the children leave. Again, quite eerie, but these choices are in line with many productions. Then. Macduff’s house. Lady Macduff argues with Ross about her husband’s departure. Her children enter. They are the weird children, quite alive, and carrying the dolls of the previous scene. Ross leaves, the murderers enter, killing all. Ross returns as witness (remember). Then Seyton arrives and Lady Macduff and her children arise, following him. When Malcolm besieges Macbeth’s castle, the dead are there, wielding swords and carrying branches, Ross among them. When Macduff fights Macbeth, the dead are there, haunting his steps. Macduff’s daughter steps between them during the fight: Macbeth sees her and starts; Macduff kills him, and then sees the ghost of his wife. Malcolm enters and Macduff proclaims him king. Malcolm is silent. Then Ross speaks from the balcony as he did at the play’s opening, prompting the new king’s words. Malcolm speaks, overwhelmed by his new duties, but standing firm. The dead pass on. Seyton opens a door, and Macbeth rises, stepping into darkness. I’m not entirely sure how to read this production, this twist of the witches into the weird children. At the play’s end I believed that Ross is a priest of the old order, of the defaced saints and demolished altars. Somehow, he speaks for the dead, putting word in Malcolm’s mouth, and the lets the dead speak for themselves. The weird children are not evil: they are the innocent seeking vengeance, the dead reaching out to create kings and destroy them. It is an uplifting vision: the hope that if someone will speak for the dead (priests, playwrights, even playgoers) then the voices of the dead will effect political change. Macbeth’s “tale told by an idiot” is just that: the voice of a madman divorced from his humanity, the sound a tyrant makes when he falls. The children prophesy a different kind of life. In a world of political unrest, of internet protests and grassroots revolutions, the voices of the dead can have great power, and might bring great hope. But who hanged the children in the first place? King Duncan’s men? If so, Macbeth avenges them, and they only turn on him once he chooses to murder Banquo. Characters in the play declare that Duncan was a good thing (historically unlikely, but Shakespeare seems to alter that). Why does Cawdor rebel before the start of the play, Cawdor who knows how to die honourably? Are rebels false men, or are they equivocators who know how to harness language to fight power and tyranny? I don’t know that the play (or the production) offers any final answers. But Boyd’s directorial vision, alongside Slinger’s fully flourished performance of Macbeth (empty and soulless at the top of the world, a man reduced to the thirst for mastery), these things have reopened Macbeth for me, a play that I thought I had mastered: who speaks for the dead? In a recent American Repertory Theater article, Brian Doerries makes a bold claim about Theater of War, a staged reading series of Sophocles’ Ajax and Philoctetes funded in part by the Department of Defense. Doerries writes, “People who live lives of mythological proportions, who confront the darkest aspects of our humanity and face life and death stakes on a daily basis, have no trouble relating to ancient myths.” Theater of War, created in 2008 by Doerries, is a production of Outside the Wire, LLC, a social impact company co-founded by Doerries and Phyllis Kaufman that uses theatrical readings as a platform for open discussions about pressing social issues, including post-traumatic stress disorder, the reintegration of soldiers into the civilian population, and the high rate of suicide in America’s military today. Theater of War, in particular, stages readings that focus on soldiers scarred by war—both physically and psychologically—and encourages discussion about how other soldiers and civilians can respond to such war wounds. If these staged readings may act as a test of Doerries’ claim, the success of Theater of War lies in the reiteration of the ritual: Theater of War’s March 26, 2011 reading of Ajax at Emory University is the 149th such performance before a military or mixed audience of soldiers and civilians, reaching a total of over 25,000 individuals. At this performance, the reading itself lasted a mere hour. The discussion afterward stretched longer, as audience members shared their reactions to the play and their own experiences with war. Theater of War works, but why? Doerries claims that the production’s effectiveness comes from the power of myth and the transhistorical touch of war: those who live mythic lives, like American soldiers, can understand mythic rituals. Thus, Sophocles’ works are unlocked by lives spent in the face of death and violence. Doerries writes, “It’s as if these rarely produced plays were written in a code that we civilians could not understand and that military audiences had to explain to us.” Doerries suggests that the key to Sophocles is the right audience: yet Doerries’ words (though they make for excellent publicity) only serve to mystify the theatrical process. Theater of War does not connect with spectators merely because it reenacts ancient rituals suited to military audiences: Theater of War also goes to great lengths to stage these readings of Ajax and Philoctetes in a way that encourages and reinforces the empathy of spectators. Soldiers (and civilians) have “no trouble relating” to the sad songs of Greek drama because Theater of War does not produce these plays: it stages them in the theater of the mind. Sophocles’ Ajax tells the story of its eponymous hero’s madness and suicide. During the ninth year of the Trojan War, the nigh invincible Achilles falls to a lucky shot from Paris’s bow: Ajax, the “shield” of the Greek forces and their strongest remaining warrior, expects the honor of receiving Achilles’ armor. Odysseus outwits Ajax, however, winning over the Greek generals through rhetoric and deceit, claiming the armor as his own. Shamed by this betrayal, Ajax stalks out into the night, planning to assassinate the generals and Odysseus. Yet Athena, Greek goddess of military cunning, thwarts Ajax’s vengeance by driving him mad, sending him into the fields to slaughter cattle instead of men. Sophocles’ play begins as Ajax recovers his wits and learns of his botched treachery. The play depicts Ajax’s shame and subsequent suicide, as well as the reactions of his family and fellow soldiers. A full production of Ajax faces the difficulties of most Greek drama: it suffers from archaisms of form and content that may trouble contemporary audiences. The communal voice of the Greek chorus, for instance, has no real parallel in modern drama, and the hand of the gods in human affairs (deus ex machina) jars with a psychological understanding of human behavior. Rather than confront these difficulties, Doerries wisely omits them in his translation and adaptation of Sophocles’ text. He reduces the Chorus to a character rather than a commentator on the action, cutting the choral songs characteristic of Greek drama. He also reduces Athena’s presence by framing Ajax’s madness as the result of post-traumatic stress disorder rather than the result of Athena’s divine will. Doerries reinforces this framing by utilizing military language in his translation, including more contemporary phrases such as: “affirmative,” “death parade,” “death march,” “report to me immediately,” “shell-shocked,” and “thousand-yard stare.” Thus, even on a textual level Doerries adapts Sophocles’ text to a modern audience. Though Doerries is the Artistic Director of Theater of War as a whole, his contribution to the March 26th staged reading of Ajax rested mostly in his adaptation of the text and his facilitation of the post-reading discussion. John Ammerman, Artistic Director of Theater Emory, directed Emory University’s Theater of War performance. Following Doerries’ terse translation, Ammerman presented an Ajax that was less a performance in its own right than an embedded portion of the night’s discussion. The event was held in Emory’s Cannon Chapel, which had the feel of a community center rather than a theater or a church: there was no stage or pulpit, merely a long fold-out table with microphones for the cast and a dozen rows of chairs for the audience. The program described the staged reading as a “presentation of scenes from Ajax,” thus highlighting the necessary work that Theater of War did to frame those scenes. Ammerman drew attention to this framing: while it is common practice in staged readings for an actor to read stage directions aloud, Ammerman’s cast also announced scene changes, provided background information on the action, and informed the audience about any character doubling within a certain scene. For example, the stage reading opened not with Athena’s lines but with a dramatic summary of the Trojan War and of Ajax’s disgrace, information readily available to an ancient Greek audience but left unmentioned by Sophocles until halfway through the play. This introduction was more storytelling than staging, the necessary narrative context for a diverse audience that ranged from Emory students to military veterans: no knowledge of Greek myth or theater convention was required. There was no transition between this summary and the play itself. The Chorus (Blake Covington) announced “Scene One,” and Ajax began: Ammerman himself read Odysseus (described in the program as “the director of Greek intelligence”) opposite Lisa Paulsen as Athena. When the reading moved to Scene Two, an actor announced that Lisa Paulsen would now read for Tecmessa, the wife of Ajax: Paulsen transitioned flawlessly from the deific commander to the grief-stricken wife. The reading pushed forward, enabled rather than hindered by the explicit framing of the text. This framing also pushed Ajax in new directions. The cast was seated (from stage right to stage left): Ammerman (Odysseus); Bruce Evers (Ajax/Agamemnon); Tim McDonough (Teucer); Lisa Paulsen (Athena/Tecmessa); and Blake Covington (Chorus). Odysseus and the Chorus spoke from the fringes, outsiders and onlookers to the main action. Interestingly, Ajax was not seated center: Teucer, silent until the later half of scene four, took that position. Thus, Ajax and his wife were separated by a physical barrier of silence. Though the Chorus looked over to the other characters, watching their words, the other characters rarely shared glances. Ajax and Tecmessa always looked to their scripts: only words could hope to join them, a hope killed by Ajax’s death at the end of scene 3. When Evers spoke again as Agamemnon in scene 5, it seemed as if Ajax’s voice and body had been usurped by his enemy Agamemnon. While Paulsen distinguished her two characters (largely through Tecmessa’s grief), Evers’s roles shared a haughtiness of speech. Thus, the quite explicit doubling of the staged reading (unmasked by costuming or even a change of space) questioned how different these two soldiers really were. Teucer (McDonough): That’s all I have to say. On one level, Teucer announced the end of his funeral speech for Ajax while Covington and Evers announced the end of various degrees of framing (scene and play, respectively). On another level, all through actors have announced ends of a sort: McDonough, the end of speech; Covington, the end of action; Evers, the end of a story and of a life. These stage directions served not merely as necessary information for the audience but also as meta-theatrical lines within the reading itself. Theater of War did not merely represent Sophocles’ text: the production supplemented Ajax with storytelling frames that both commented on the action and communicated it to a contemporary audience. In scene 2 of Ajax, Tecmessa warns the Chorus that their own suffering will increase when Ajax comes to his senses: “In his madness he took pleasure in the evil that possessed him, all the while afflicting those of us nearby. But now that the fever has broken, all of his pleasure has turned to pain, and we are still afflicted, just as before.” While Ajax is mad, Tecmessa and the Chorus only experience their own grief at his fate: Ajax himself is oblivious. When Ajax learns of his mad slaughter of cattle, he will experience that grief himself and then Tecmessa and the Chorus will, through empathy, feel his grief in addition to their own: “twice the sorrow.” During the discussion portion of the Theater of War performance, Doerries skillfully turned this passage into a question for the audience: what does this line mean? The responses from the audience were various, but to my mind they all circled back to empathy. In Upheavals of Thought, Martha Nussbaum defines empathy as “an imaginative reconstruction of the experience of the sufferer.” Empathy allows us to recognize people as people, showing “a basic human respect. The evil of utter dehumanization seems worse” (334). Theater of War encourages such empathy, presenting Ajax’s suffering as the plight of the soldier in any time period. In part, this empathy requires stripping away historical difference: Theater of War does not consider the circumstances (or validity) of either the Trojan War that Ajax experiences or the various wars of 5th century B.C.E. Athens (the Persian and Peloponnesian Wars). Theater of War’s goal is to reveal the soldier as fundamentally human. Ammerman’s production, for example, highlighted the human suffering in Ajax by emphasizing the non-linguistic lines of the text: sighs, groans, and screams. 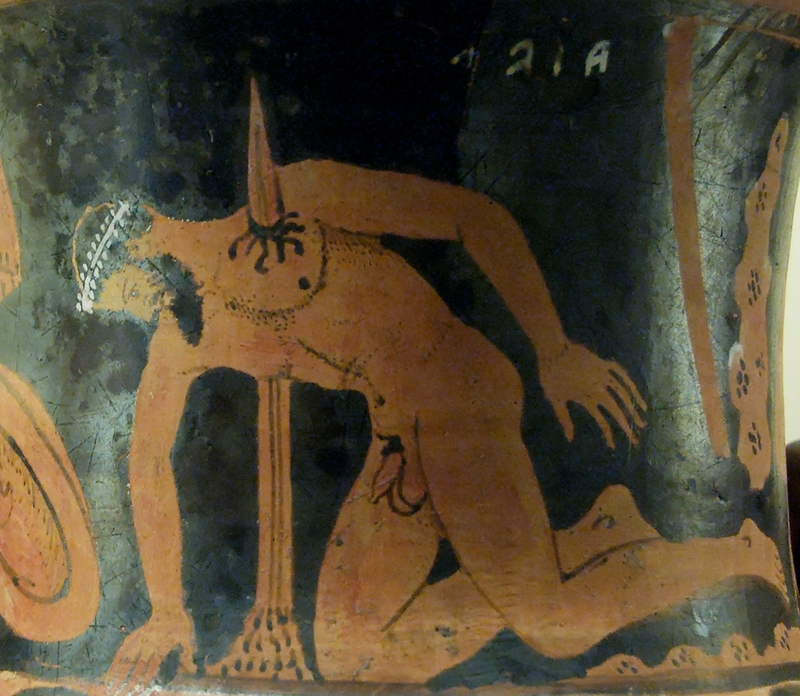 Most notably, there was no announced shift from scene 3 (Ajax’s suicide) to scene 4 (Tecmessa’s discovery of his body). Evers ended Ajax’s last line with a rasping growl, pantomiming the sword impaling his heart, as if the air was escaping from his punctured lung: “The rest I shall say to those who listen in the world below.” Paulsen then began scene 4 before scene 3 had ended, delivering Tecmessa’s “[inhuman cry].” Death translated instantly into grief, and the audience could connect to the story on a purely emotional level: the sound of the human voice in pain. Nussbaum notes, however, that empathy is not merely a matter of seeing oneself in the shoes of another: “Empathy is like the mental preparation of a skilled (Method) actor: it involves a participatory enactment of the situation of the sufferer, but is always combined with the awareness that one is not oneself the sufferer.” Empathy can bridge gaps of misunderstanding: between ancient Greeks and moderns; between soldiers and civilians. Yet merely imagining oneself in the place of another without remaining aware of their otherness is a dangerous egocentrism. There is a subtle but important difference between empathizing with Ajax and imaginatively becoming Ajax. Doerries post-performance discussion was one of the most effective uses of open-ended Socratic method that I’ve ever seen in a community setting: a moving experience, and a testimony to the value of teachers in our society. Yet by de-historicizing Sophocles’ text, Theater of War risks merely offering our society a mirror of itself. Here lies the danger of Doerries’ claim that “people who live lives of mythological proportions…have no trouble relating to ancient myths.” Certainly, drama builds off of our own emotional experiences, and only a soldier has experienced the carnage that haunts Ajax’s mind, the sad song that makes his name. Patrick Colm Hogan describes this collection of emotional experience, drawing on the writings of Abhinavagupta, a tenth century Sanskrit philosopher. Hogan writes, “All our experiences leave traces in our memory. These traces bear with them the emotions we felt at the time. The mind accumulates these traces and they contextualize each new experience. We respond to the present in terms of the collective effect of the traces left in our memories by the past.” To some extent this emotional experience grants the military community a privileged position from which to respond to Sophocles’ Ajax. The role of drama, however, is to create aesthetic experiences that can approximate personal ones: as a civilian, I will probably never experience the horrors of war firsthand; yet through art, through productions like Theater of War, I can see an image of that horror and I can begin to empathize with the plight of a soldier. The staged reading format is an efficient device for promoting such empathy, particularly as Ammerman directs it, for all the archaisms and aesthetics props that might hinder my empathy are stripped away, leaving only the human voice and raw emotion. The great virtue of Theater of War is that it succeeds at promoting empathy by pairing staged readings with open discussions of individual spectators’ reactions. The danger of Theater of War is that spectators may believe that they can empathize with Ajax purely out of the power of myth and personal experience; thus, they may not recognize the power that theater has to enable such moments of empathy. As Nussbaum argues, one must be aware of differences; like an actor, an empathic spectator must both put on the role of Ajax and remain themselves. As Theater of War expands its focus from wholly military audiences to mixed audiences of soldiers and civilians, the program may do well to balance the need for identification with ancient Greek soldiers and the fact of historical and cultural difference. Doerries closed the performance at Emory by saying: “You’re not alone in this room. You’re not alone in this country. You’re not alone across time.” An important sentiment, to be sure, but one that should be balanced by Sophocles’ own text (in Doerries’ translation: “It is true, but still hard to understand” (Tecmessa, Ajax Scene 2). Jonathan Shay, Achilles in Vietnam (New York: Scribner, 1994). Brian Doerries, trans. Ajax. Sophocles. Martha C. Nussbaum, Upheavals of Thoughts: The Intelligence of Emotions (Cambridge: Cambridge UP, 2001) 327. Patrick Colm Hogan, Cognitive Science, Literature, and the Arts: A Guide for Humanists (New York: Routledge, 2003) 156. *Love’s Labour’s Lost,* a recap. To the cast and crew of Love’s Labour’s Lost: bravo! It’s amazing just how well 400-year-old comedy ages. I don’t think I’ve laughed so hard watching Shakespeare since…okay, maybe never. And the show also received some major publicity: it showed up in the Crimson White (here), on the front page of UA’s website last week, and as the “picture of the week” on mybama.ua.edu. Shakespeare’s cultural capital? Be sure to check out Joey Gamble’s review of the show on Vanishing Sights.